Baby it's cold outside. And blustery. Perfect weather for soup! I recently read an article about how the State of Texas have banned death row prisoners from requesting a last meal after one inmate asked for 'two chicken fried steaks, a triple-meat bacon cheeseburger, fried okra, a pound of barbecue, three fajitas, a meat lover's pizza, a pint of ice cream and a slab of peanut butter fudge with crushed peanuts'. Rather flippantly, I think that would have been just as likely to kill him as the lethal injection, but in today's straightened times, I can see the State of Texas' point. It got me thinking about what I would request if I knew I had just one last meal to eat ever. If I was stuck on a desert island, I'd want to take a toaster and an eternal supply of toastables and butter (I just made that word up - but bread, bagels, waffles, crumpets, muffins....). But if it was definitely the last meal ever ever ever then I would be stumped as it would depend on my mood. Most likely it would be something that would bring back memories. Like cauliflower soup. Most people blanch at the idea or insist on adding so much stilton that the cauli flavour is lost but my mum used to make cauliflower soup when I was a kid and it is one of my favourite ever tastes. In fact I had some from the canteen today at lunch and was pleasantly surprised that theirs was passable - but still not a patch on mum's. For main course, I'd have either 'Cheering Up Dinner' - my beloved grandma's roast chicken with all the trimmings or her sausage and potato bake and for pudding my mum's raspberry fool and a chocolate fondant with proper vanilla ice-cream. And something with toffee in it... and then a Tia Maria coffee to wash it all down. Because I could. And I wouldn't care about needing elasticated trousers or looking like a beached whale because I would've enjoyed myself. And I'm still enjoying myself fifteen days into the recipe-trying. I made soup for tea too as I am soooo cold for some reason and when I'm cold, I like red soup. 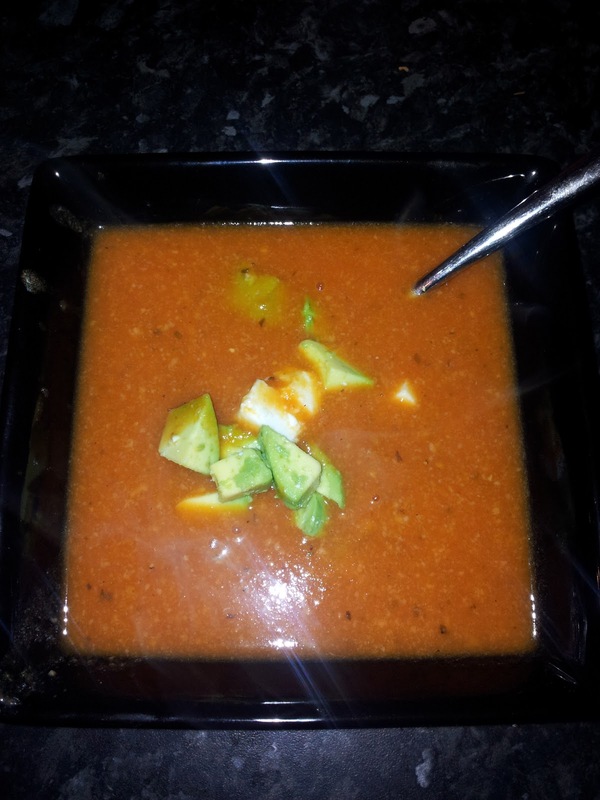 Today, it was Thomasina Miers' Tortilla soup. If I'm honest, I'd use less liquid as it was a bit to thin for my liking and all the toppings sank rather despondently to the bottom, rather than gracing the top like the picture in the book. Nevertheless, the flavours were amazing. Sweet, Italian-inspired tomato soup (this is a Mexican recipe!) with a smokey chipotle-chilli kick on the after-taste, complimented by creamy avocado and salty feta. I didn't have any coriander to make it look pretty - the one in my garden has finally given up the ghost. Heat the oil in a large pan and sweat the onions over low heat for 10 to 15 minutes until soft. Add the garlic and tortilla and cook, stirring, for 5 minutes. Add the chipoltes, tomatoes, sugar, oregano and seasoning. Cook for a further 5 minutes before adding the stock. Simmer for 10 minutes then blitz with a stick blender.